Cooking on the Go, At Home, Anywhere You Like! I LOVE to cook, and I have made it my mission over the past few months to bring a website to the internet that will help people get the best from the dishes they like to prepare. Over the years I have used both gas and electric hobs, but my favorites are cooktops that use induction heating, for a variety of reasons. However, it’s not my personal preference that I aim to press upon you. After all, it’s your decision and my website is here simply to give you guidance on some of the cooktops I’ve come across that I think are worth telling you about. For this review, I have two for you. 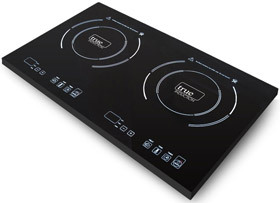 The True Double Burner S2F2 and the True Double Burner Inset model. Before I get on and tell you all about these cooktops, you should know there is nothing on the market that’s completely fool proof so if you’re looking for something that will “cook” for you, that’s not going to happen. Although, I must say in the following few words you’re likely to get pretty close to something like it. Induction heating means you only get heat where you need it. That is to say, both of these models will only heat the cookware you place on the burner (which has to be induction compatible). You have 1800 watts of power that can be utilized through both burners. 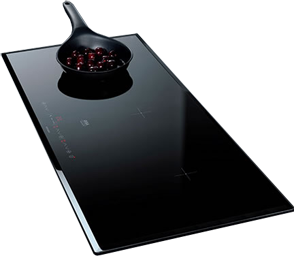 This happens to be a very important point because unlike many other induction cooktops on the market that distribute the wattage evenly between each burner, these will allow you to take say, 70% up on one and 30% on the other. This makes them perfect in terms of energy efficiency, and it also allows you to cook two entirely different types of foods at the same time. Because only the cookware is heated, and not the rest of the cook top, you also won’t get additional heat in the area where you’re cooking (great for hot summer days). You get the benefit of a touch button control panel with LED digital displays which are easy to read, and they’re conveniently located beneath the burners. The surface is completely flat so you don’t have any of those annoying crevasses or lips to deal with which can be difficult to clean. In fact, because of the materials used, you can clean you cook top with the same everyday cleaner you use on the rest of your surfaces. The temperature controls are precise, and you can choose between ranges of 150 – 450 Fahrenheit which gives you a lot of scope with the types of food you can cook. Actually, if you like to bake and often have the need to melt things like chocolate or other confectioneries, you can do this straight from the pan. No more double boiling! Oh, and I can’t forget the timer which helps you get perfect results every time. Over the years I have suffered many minor burns when using a hob, and as you probably know it hurts! These induction cooktops will make this a thing of the past. As said, the only place you need worry about in terms of heat is where the cookware sits. However, if you remove it and forget to turn the heat off both of these models will power off on their own. This helps with energy efficiency and stops overheating. For those of you that have trouble remembering when something is boiling it should be turned down you also get the benefit of a sensor that detects overflows. If this happens, the unit will switch off. You may be wondering what the difference is between the S2F2 and the inset model. Well, the first is about as portable as you can get with cooking. You can use it in your RV, out on the patio (if you have a power outlet), and you can even take it camping with you. The second is a built-in version, but just as versatile. You don’t have to install this cooktop where your oven is located. You can have it anywhere you like. In fact, if you’re looking for more than two burners, you can install two side by side, or even have them in separate places which helps make better use of your kitchen space. I love these cooktops, and that’s why they get a mention on my website. They’re not as expensive as you might think either. Both of them can be found on Amazon and usually cost well below the list price. You can find the S2FT here and the inset model here. If you want to change the way you cook forever, why not take a little peek?